11 people killed simply for being Jewish. I was raised Jewish but I will be the first to admit I am terrible at practicing my religion at all. That a madman murdered innocent people for being Jewish still hurts my soul. 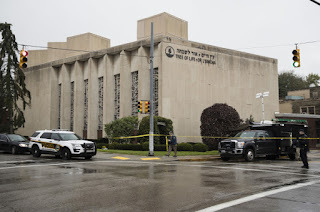 The question should not be the ignorant one our President asked—Why wasn’t the Synagogue armed?” as opposed to, “Why should we think a place of religion needs to be armed?” Is there that much hatred towards a religious group we need to arm their place of worship? I ask that question then see our country’s fear of any kind of Muslim and recall when they started blaming the Muslims for everything after 9/11. It was terrible and I figured it was only so long till they started blaming Jews again too. Jews always make great scapegoats throughout history—that’s why all my Jewish relatives who came to America were fleeing something. They were escaping the Pogroms, the Holocaust, etc. They came to America for safety for themselves and their children. It’s 2018 and people were shot in cold-blood for being the, “Wrong religion,” by a murderer convinced Jews were ruining the country and behind things like the, “Migrant caravan.” This was in the same weekend a man sending mail-bombs to people he thinks are enemies of the, “Real America,” was finally located along with his van plastered with pro-Trump, alt-right imagery plus pictures of liberals with cross-hairs over them (in addition to declarations that the media can't be trusted). Our so-called leader accepts no responsibility for his disgusting rhetoric inspiring a rise in hatred, blaming his foes and only stoking the rage-fires of his unquestioning followers—telling them only to trust his word and no one else’s claims. It’s 2018 in America, but the hateful past returns. Jews make great scapegoats, just look at Germany in the 1930’s for proof of that—or you can simply glance at America today. I Wish Everyone a Happy Halloween! My Wife and I Have Been Married Three Years Now!